Back on March 7th I presented a workshop in Boulder called "Intro to Patching Virtual Modular Synths". I thought I'd pass along a concept from this workshop that might save you money as well as inspire you to start down the path of modular and semi-modular sound design with your existing rig. Many of you already have modular and semi-modular synths but don't necessarily view your current rig with this lens. To illustrate this idea I came up with the following thought experiment. 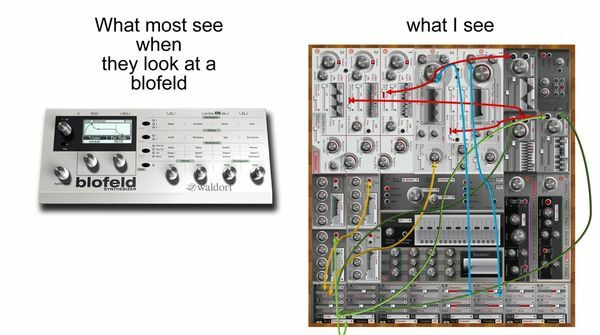 I've spent a lot of time doing sound design on the Waldorf Blofeld. It's not one knob per function, but does have a nice display with interactive feedback on sound design elements. It's also semi-modular. After some dedicated use with instruments like this and more complex plugins, you start holding the architecture in your head. 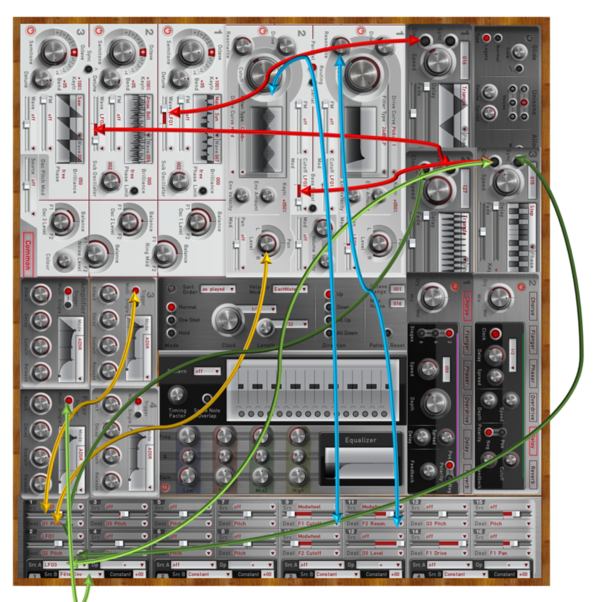 As a thought experiment I thought it would be interesting to pull apart the modules used in a Blofeld preset and rack them up as if they were in a hardware rack – then draw patch cables that represent what is really going on with the preset and signal path. I also own Waldorf Largo which is very similar to the Blofeld (see this post and mindmap Waldorf Largo vs Blofeld). This being the case, to save time, I took screen shots of the Largo and then laid them out in a "case". One last note on the Blofeld before you move on. If you have a Blofeld, make sure you schedule some time to check out binary modifiers in the mod matrix. Here is an excellent paper on the topic from http://synth.stromeko.net/Downloads.html. 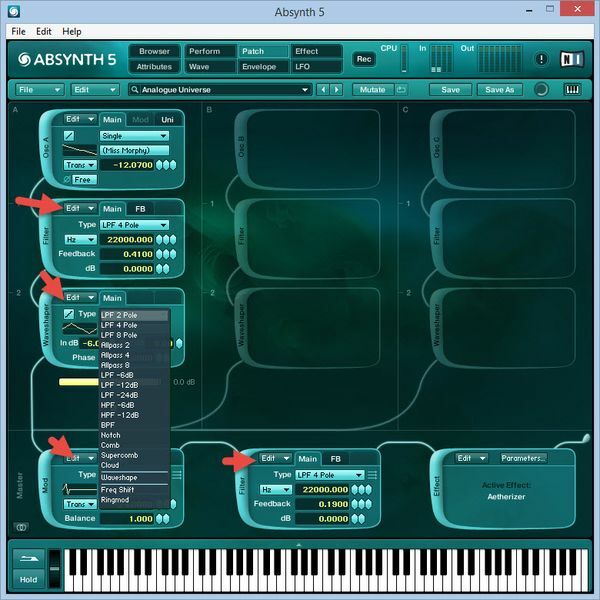 To illustrate some of the sonic range you can get with an instrument like Largo/Blofeld when you take advantage of the mod matrix to add real-time expression here is horror soundtrack I produced solely using Largo in one real-time improvised pass. 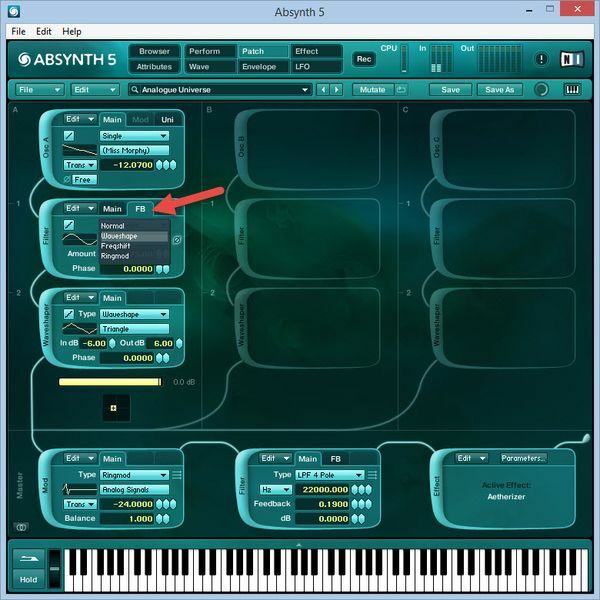 Another awesome synth you might not have considered as semi-modular is Native Instruments Absynth. All along it's signal path you can use the edit button to swap in a huge variety of modules overriding the default module for each slot. You can even swap modules within modules. For example, if you select a filter type that supports feedback, you can swap in a wave shaper, frequency shifter, or ring modulator. BTW – Manipulating the audio in the feedback of the filter is a great way to add non-linear results to sounds that would normally be in the realm of unstable analog circuits. A sound design experiment showing the darker virtual analog modelling side of Absynth (no samples here) to illustrate Absynth's range beyond the typical motion pad :^) This piece is an improvisation using an original preset patched with two oscillator in single mode and two Filters with feedback. I'm using waveshaping feedback mode and modulating filters and resonance with envelopes which creates the sonic movement as the envelopes play out. Another great and affordable choice if you want the vibe of working with patch cables is U-HE ACE. It's only around $80, sounds fantastic, has a very good manual, has a great set of free YouTube tutorial videos and recipes produced by U-HE, and is way more than the sum of it's parts. It's a great learning and teaching instrument and using ACE will help you wrap your head around modular sound design recipes. Working with ACE could help you make better decisions about what you might want in a hardware system. Here are some other excellent choices in the virtual realm. Of course this is a partial list of what's available. 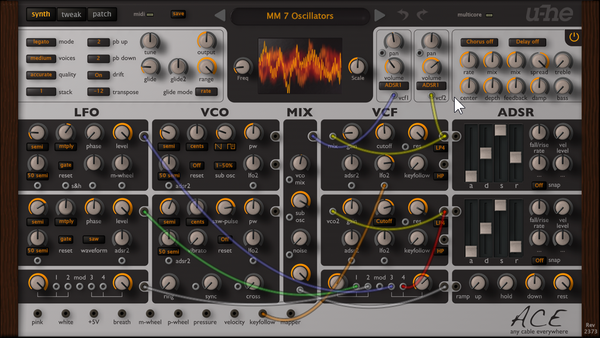 Pop the hood on some of your favorite virtual instruments – or put a new lens on the way you look at your existing hardware. Perhaps you'll find some modular and semi-modular joy in what you already have. I hope this post inspires you to use what you've got and/or helps save you time in money when considering choices in the hardware realm. Happy patching! Exactly the kind of thinking that inspired Reason CV/ Modular. Reason is obviously geared towards this kind of thing with it’s virtual CV & audio patching. But thinking about the synths & other devices Reason offers in a ‘modular’ way can really open up the creative potential of what the devices can do.